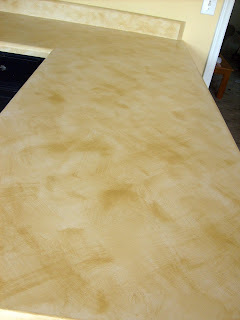 Yes indeed you can paint laminate counter tops. The key is a good primer and a good sealant. I have been meaning to do this for so long and we finally bought the materials to do it and after a week of brainstorming and a day of practicing I bit the bullet and painted my own counter tops. I really, highly suggest practicing before going at it on your very own counter tops. First of all practice practice practice! First I tried sponge painting, didn't like it, then I tried troweling it on, didn't work, then I finally tried a color wash technique using "x" strokes - loved it! Also when you practice, try out your colors in different orders. The lightest color as your base will look completely different than your darkest color as a base. When I was practicing I used the darkest as the base and then decided it was too dark. 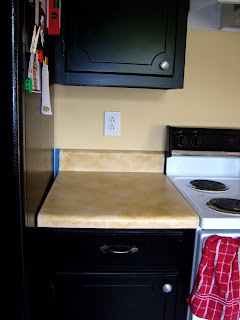 Without trying it out any other way I decided to go ahead and paint my counter tops using the lightest color as a base. Over all it looks nice but in my opinion I ended up with too much yellow in my kitchen! oh well, but I do love the look, it's very Italian-ish. 1) Clean your counter tops very well. I used undiluted maximum strength Simple Green. Run your hands over your counter tops to make sure there are no rough food particles stuck on. Use a scraper or a butter knife to scrape them off. 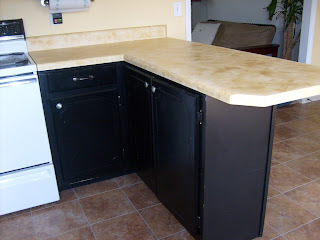 Use your foam roller to roll the main parts and a foam brush to do the top of the counter top back splash. 4) Mix your 2nd coat. Mix glaze and paint to your desired consistency, following manufactures suggestions. It is much easier to pour your glaze into a container, then with a paint stick drizzle your desired color into the glaze, adding it a little at a time. I used about 10 parts glaze to 1 part paint. Now using your natural bristle brush dip into the paint a little at a time. On your counter top you will paint a small "x." Now repeat that "x" motion in the surrounding area until the paint is blended to your liking, and the brush needs to be reloaded. I found that a small "x" worked better than av large "x." 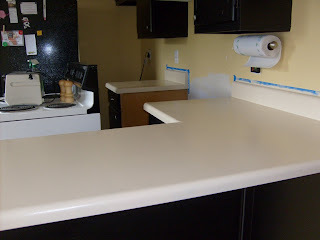 5) I did one section of counter top, then went ahead and mixed up my 3rd color with some glaze and applied that before my counter tops where completely dry. Again this is where the practice comes in. You might find that it is easier for you to wait for that second coat to dry before applying the last coat. 6) allow to dry and then seal using a non-yellowing sealant, such as an epoxy sealant etc. 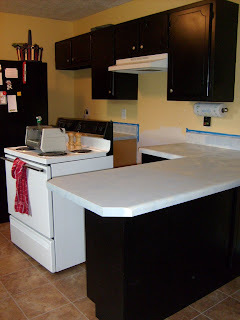 I still have one more counter top to do, over by the kitchen sink and then I will seal them all. I'll be using a marine grade sealant that Mr. Debutant has lying around. Here are pics of my progress for your enjoyment! 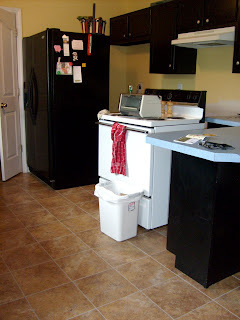 First off, a picture of the blue counter tops with my new flooring! And here is the whole she-bang, counter tops, cabinets (which we painted when we first moved in to the house) and the new floor. I love my kitchen! Wow, you've been really busy. It looks great! This is something you would see on HGTV. Great job! What a neat idea! My parents need this information BADLY! Thanks! Hey, there! I finally got to put you on my blog list...again! Last time I did it, it got deleted! You are so busy missy! Kitchen looks great! You are awesome!